The fourth Formula 1 grand prix of the season takes place this weekend in Sochi, Russia on Friday 28 April to Sunday, 30th April 2017. Sochi Autodrom, a circuit with a very short history where Mercedez has dominated the three grand prix taken place here so far. Lewis Hamilton has won twice while Nico Rosberg was successful last year. To put their dominance into perspective no car other than Mercedez has even lead a single lap on this relatively new circuit and we can expect similar results on Sunday. The weekend coverage starts with Friday’s practice sessions followed by Saturday’s qualifying at around 10:00 am uk time and we will have the Sunday race starting at 13:00 uk time. The weekend coverage start with traditional friday practice sessions early in the morning while the qualifying sessions will take place on Saturday, 29th April at around 14:00 CET / 13:00 uk time. Sundays coverage start at midday and the race will begin at 13:00 uk time with Skyf1 broadcasting it live in the UK. Russian F1 Grand Prix 2016 Preview: This will be the only third grand prix in Russia and 5.8 kilometre track specially designed for F1 is the only such motosport track in whole Russia. The circuit is the third biggest this season behind Silverstone and Spa but flaws in mid way through the track requires drivers to produce some technical brilliance on the certain corners. Defending champion Lewis Hamilton is already trailing Nico Rosberg by 36 points and another bad weekend will put his title challenge in jeopardy if Rosberg raced to yet another win this season. It all sets up this weekends Russian Grand Prix with several scenarios can Hamilton stop Resberg and can Ferrari finally put two reliable cars on the track ? Its all remained to be scene as we head to important couple of grand prixs in May. Sebastian Vettel was left furious after he was struck on the opening lap by Daniil Kvyat car and was forced out of the race. This will cause alot of a controversy post race and we will be updating here as the things develop. 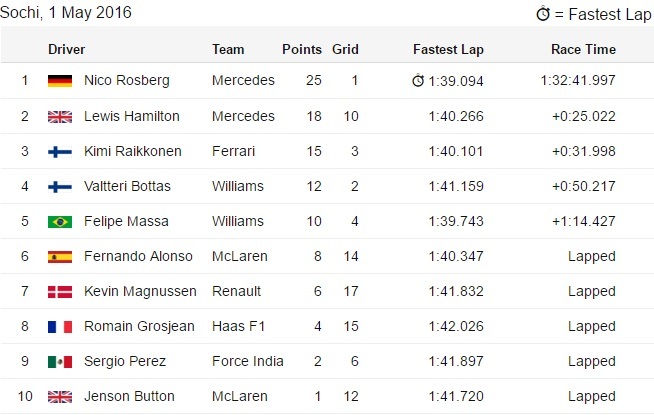 As the things stand Nico Rosberg is going to be hard to beat this season as he continue this season where he left of last season. Russian Grand Prix win was his fourth consecutive this season and overall seventh straight grand prix win starting in the last three GPs of 2015 season. This has been a very underwhelming season so far with Rosberg driving with absolute class and looks set to top the championship table having won all four grand prixs so far.